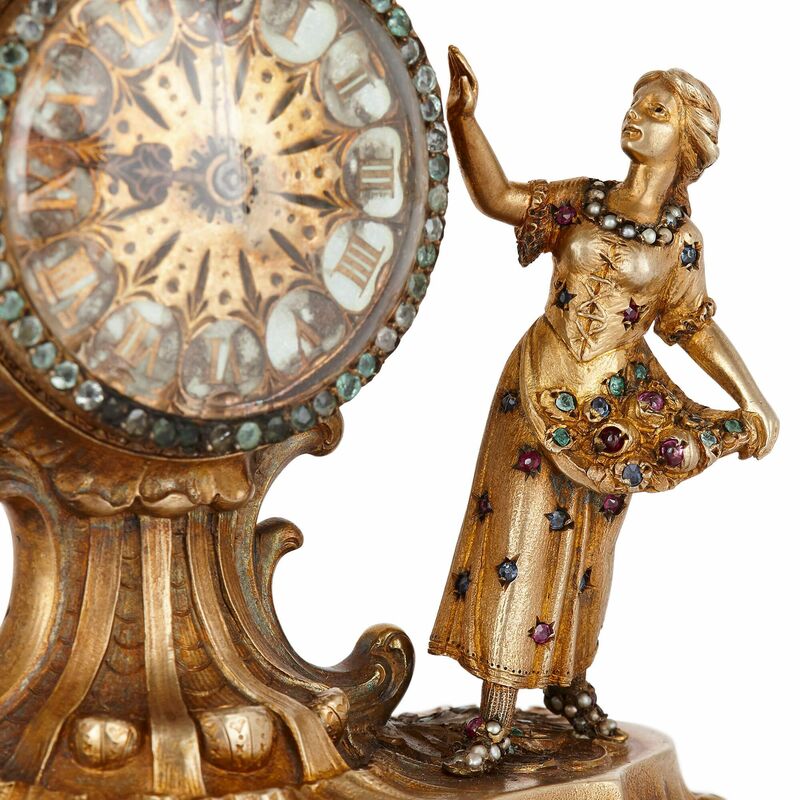 This exquisite Viennese table clock is composed of silver that has been gilded and inlaid with precious sapphires, pearls, quartz, emeralds, and rubies. This exceptional silver-gilt table clock is formed of a central enamelled dial, surmounted by a cluster of fruits and a crown, all supported by a scalloped base, plinth and four C-scroll feet. 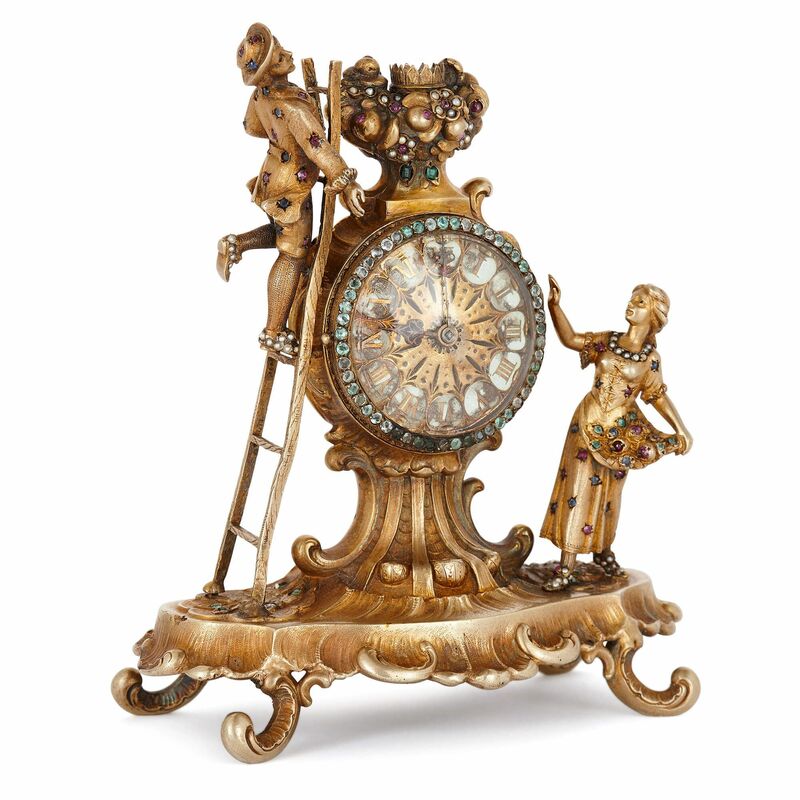 A pair of figures flank the clock dial; on the left a boy climbs a ladder, while a girl, standing on the right, watches on. The entire piece is encrusted with fine precious jewels, making this an item of true luxury and splendour. The curling feet and plinth have scalloped edges, as does the neck above, which is scrolled and fluted in Rococo-esque fashion. 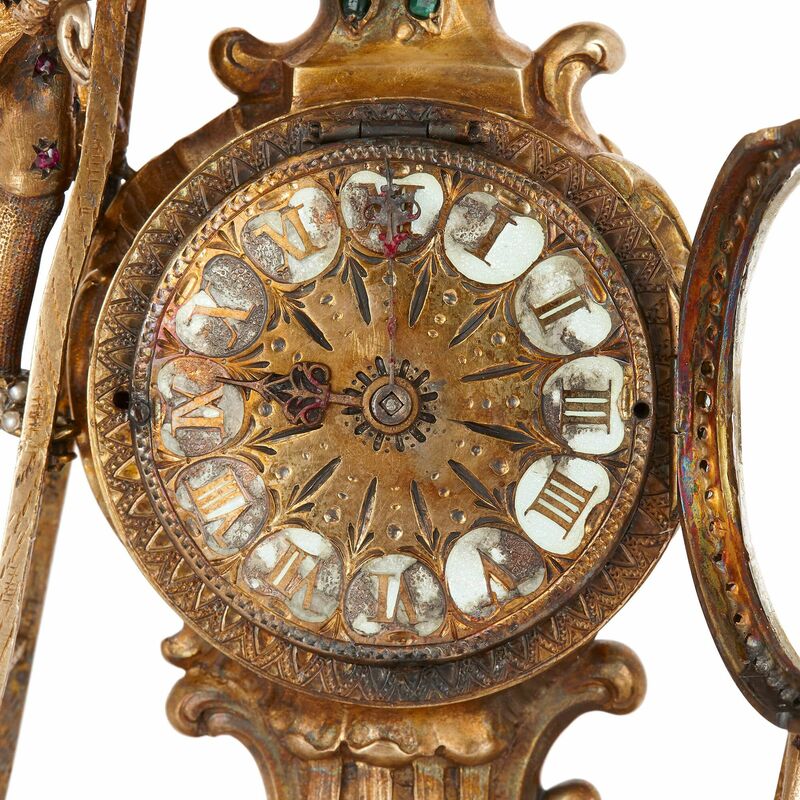 The neck supports the circular enamel dial which displays Roman numerals on its face, and which is framed by a border of light blue sapphires. On top of the clock face, there is a cluster of silver-gilt, jewel-encrusted forms which imitate ripe fruits, surmounted by a crown. 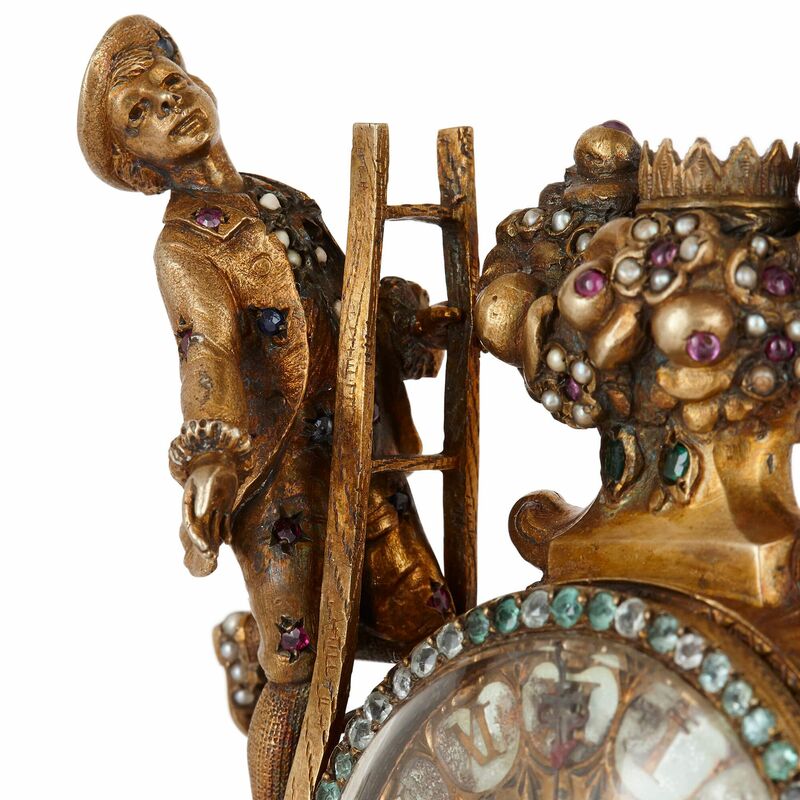 To the left of the piece, a young boy climbs a ladder to pick the fruits growing above the clock face. He wears traditional clothing that is studded with precious stones. His shoes are covered in pearls, and his coat and hat adorned with amethysts and emeralds. 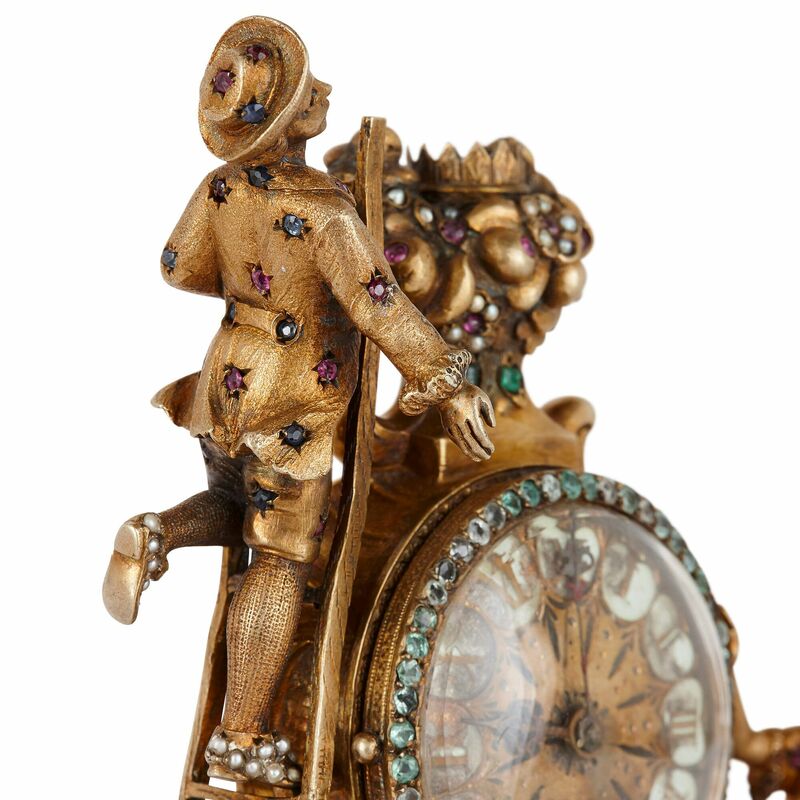 Standing on the right of the clock face is a girl, who wears similarly bejeweled clothing. She collects the precious fruits in her dress, and raises her right hand to rest against the clock face, possibly in a motion to warn her male compatriot to be careful up the ladder. Her dress is inlaid with amethysts, sapphires and emeralds, while her shoes and neckline are articulated by pearls. 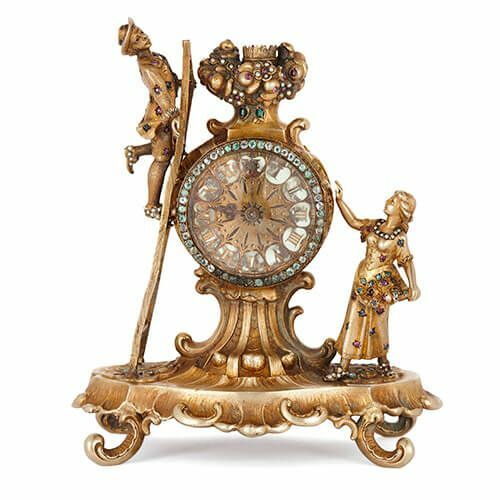 This table clock features a wealth of precious materials, which have been crafted into this charming fruit-picking scene.